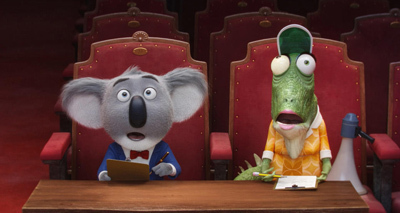 Buster Moon (Matthew McConaughey) is a koala who loves the theater - namely, the one he owns. Buster and The Moon Theater have fallen on hard times, so in order to fill those seats, he puts together a singing contest. Anyone and everyone in town is encouraged to show their talents so Buster can make them a success - and save his theater, which is about to be repossessed. The motley crew of singers come together despite their own challenges to put on a great show - but of course there are obstacles to overcome. Sing was a box office hit, grossing over $634,000,000 and spawning a yet-to-be-released sequel. You may know all about "squid power", but how well do you know Sing?